Master Nut Cracker showing various colored handles available. Walnut mounting board is shown but could be a number of various hardwoods. Thanks to all those who have ordered through the website. We soliciate ways and methods to improve both the website and our products. 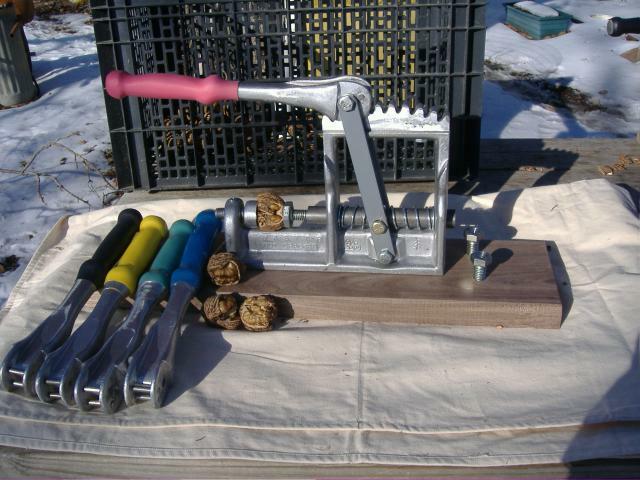 Some of the suggestions we have used are: on the nut cracker, added the covering on the handle to prevent staining the hands when cracking large amounts of nuts. Moving the mounting holes for the small anvils further apart. Changed the center bolt from a grade 5 to grade 8. NOTE: The only assembly required is mounting the board to the nut cracker and inserting the small anvils in the holes provided. On the extra heavy black walnut mounting boards the mounting bolts have been changed to longer ones that require a phillips screwdriver for mounting. A combination of clicking tabs and back spacing might be needed to cover all the tabs listed in the index. This is a completely amateur attempt to create a web page. .
We ship international but shipping charges are very high, in most cases more than the item shipped. Just shipped one to Italy, cost was almost 61.00 and they had to pay customs. Shipping of one nut cracker, 9 pounds to Canada is 49.40. With new postal rates this price has probably increased. NOTICE; THE OLD TYPE BLACK WALNUT CRACKING ANVILS ARE AVAILABLE. THESE ARE HAND MADE BUT DO USE A LATH FOR TURNING. UNLESS OTHERWISE DIRECTED THE MACHINE MADE ANVILS WILL BE SHIPPED. A NOTE ABOUT THE BASE SHIPPED WITH THE NUT CRACKER. THE WOOD USED FOR THE BASE MIGHT BE A NUMBER OF WOODS, BLACK WALNUT, SASSAFRAS, OAK, HICKORY, CHERRY OR ANY OTHER THE SAW MILL MIGHT BE RUNNING. I USE MILL RUN GRADE WHICH MEANS THERE COULD BE KNOTS AND OTHER BLEMISHES. THE BASE WILL BE SOUND AND SOLID, A CLEAR DEFECT FREE BASE IS NOT ASSURED. IF YOU SHOULD WANT A CLEAR BASE PLEASE SO STATE AND INCLUSE AN EXTRA $5.00. AT THE PRESENT TIME I HAVE AN EXCESS OF BLACK WALNUT WHICH IS OVER AN INCH THICK, THIS IS VERY HEAVY, IF YOU WANT THE LIGHTER BASE SO STATE. Just recently purchased a large amount of black walnut lumber salvaged from the tornado that destroyed the city of Pierce City Missouri. Some of this is extra wide and thick. If you would like a special base selected from this lot let me know. Also if you are a wood worker and would like your base unfinished also let me know as I have some in reserve that have not been varnished. To really improve the finish they should be fine sanded then varnished or tung oil them. If you receive yours varnished you can strip, sand an redo with either varnish or tung oil. THE INVENTOR AND MANUFACTURER OF THIS NUT CRACKER FOR THE PAST 25 YEARS HAS TURNED THE BUSINESS OVER TO HIS CHILDREN, HOWEVER HE HAS RESERVED THE RIGHT TO PRODUCE 100 NUT CRACKERS PER YEAR FOR SALE TO SPECIAL CUSTOMERS. THESE WILL BE NUMBERED, DATED AND SIGNED. BEGINNING 1 SEPTEMBER 2015 ORDERS WILL BE ACCEPTED., USE THE STANDARD ORDER FORM BUT NOTE THIS IS FOR THE SPECIAL NUT CRACKER.